Thank you for your interest in becoming a vendor at The Railroad Memorabilia & General Store. If you are a retired railroader and have railroad memorabilia or unique items to sell, you may become a vendor. You will need an email address, and be able to fulfill the order when your product is purchased. Please contact us using our contact form, for any questions or to express interest in becoming a vendor. We do not sell any operational equipment keys. We are just starting our multi-vendor store as a benefit to our Railroad Retirees. 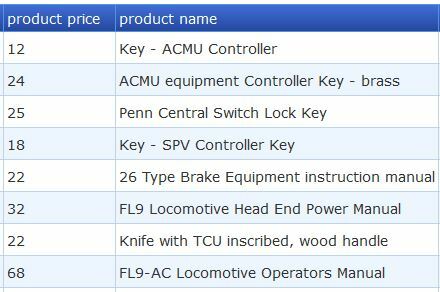 The old store ran for about a year between 2015-16 and Keys were very popular along with locomotive manuals. The sales are shown below. So if you have some items to sell, let us know.